« Shape Play with EverWeb! 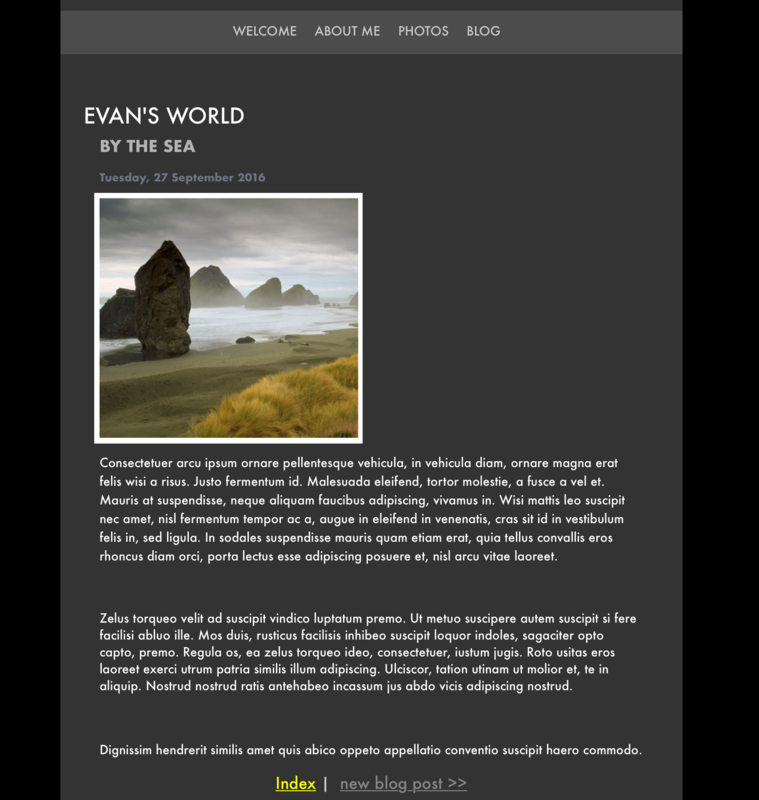 The new blogging environment in EverWeb version 2,0! 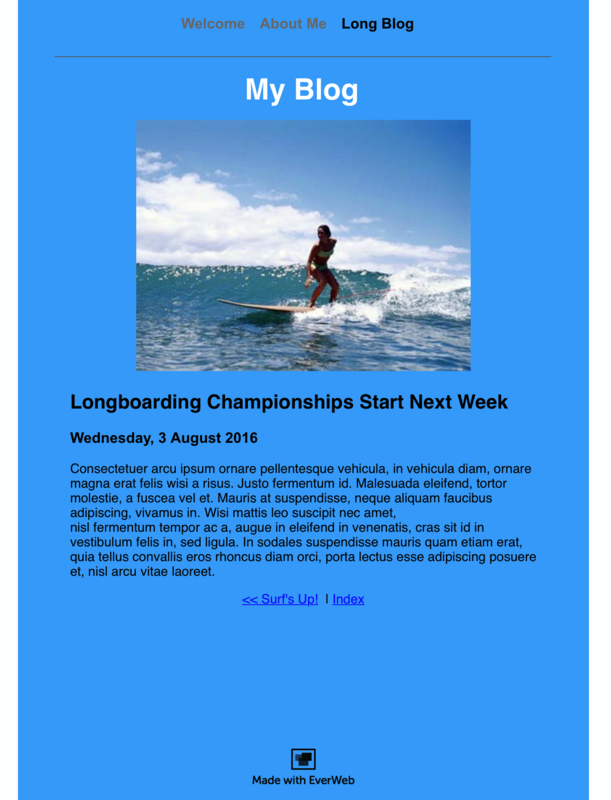 In this screenshot, an iWeb blog entry has been imported and the original image drag and dropped in to the blog post. The recreated blog post took only a few minutes to do! Import Your iWeb Blogs in to EverWeb! 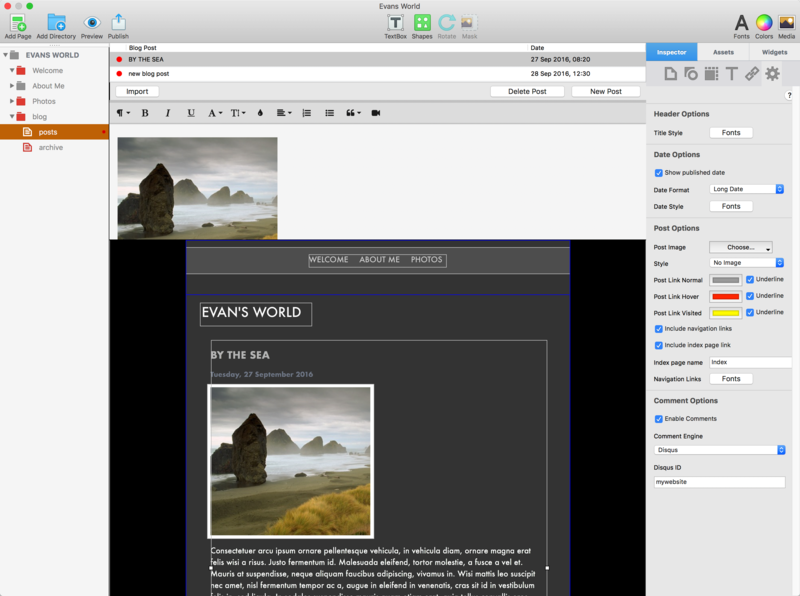 EverWeb version 2.0 will easily import iWeb blog entries into EverWeb’s blogging feature. EverWeb 2.0 will make it simple and straightforward to transfer your blog titles and text over with just a couple of mouse clicks. The screenshot below shows a sample iWeb blog entry imported in to EverWeb version 2.0. The blog title, date, time and main body text are quickly added in to your EverWeb Project file’s blog. We spent only a couple of minutes formatting the EverWeb version to match up with the original just to give you an idea of what’s coming soon. The original blog post from iWeb which has been recreated in the next screenshot with the forthcoming EverWeb 2.0 release. In EverWeb 2.0, you will be able to quickly format all blog posts at once by adding Master Page like features directly in the Blog Post Preview Window. You will also be able to easily edit blog posts using a great in-line editor which includes features such bullet lists, numbered lists, quote levels, paragraph styles and more. There’s also a choice of Disqus and Facebook Comments for your comments engine, so your visitors can join the conversation! 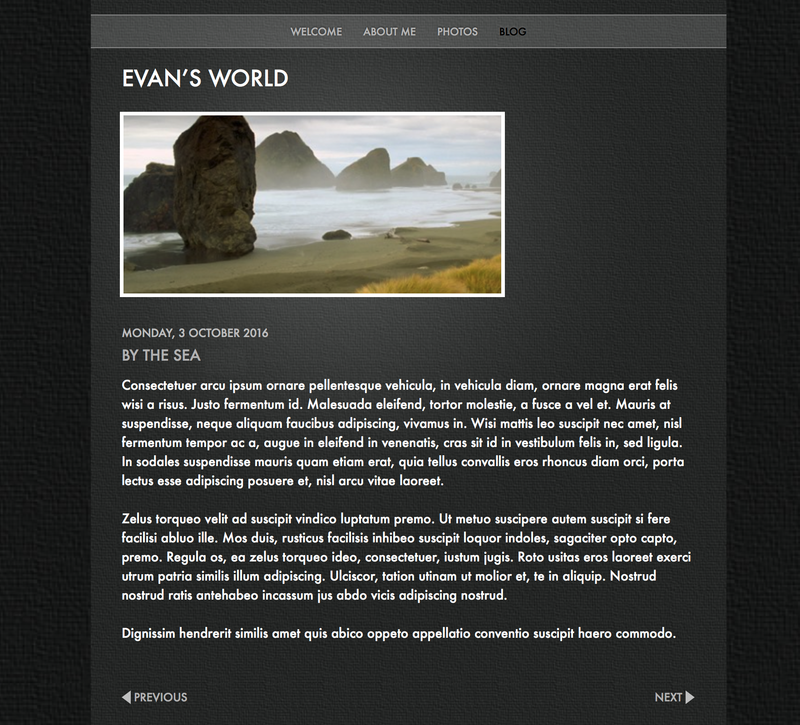 The recreated blog post in EverWeb version 2.0 uses Master Page style features to save you time and effort. There are lots of new and updated features for all iWeb blog developers to enjoy. In our example screenshot above, once the text was imported from iWeb in to EverWeb version 2.0, the page and background colors, as well as the page dimensions, were changed using the Page Settings tab in the Inspector Widow. The blog post Widget Settings were used to change the blog post’s fonts to look like how they were in iWeb. The Navigation Links to the previous post, next post and blog index were also changed and a Comments Engine added (not shown) so visitors can comment on the blog post. A Navigation Menu Widget from EverWeb’s Widgets tab was added at the top of the page to give the blog post the same navigation as it had in iWeb. Finally, the blog entry’s image file from iWeb was drag and dropped from it’s original location on the hard disk on to the Blog Post Editor Window, centered and given a background frame using a shape. Recreating blog posts from iWeb is easy and our example only took a few minutes to make. Remember that there will be some differences between the iWeb and EverWeb but it’s a great opportunity to update the look of your blog with EverWeb version 2.0 features that keep your website fresh, up to date, easy to change and easy to mange in the future. We’ll have another update soon on the upcoming EverWeb 2.0 release! We’re happy to help if you have any questions, comments or feedback for us! NEW! iWeb to EverWeb Website Conversion Service Launched! This entry was posted on Sunday, October 16th, 2016 at 6:23 pm	and is filed under EverWeb, EverWeb, Software. You can follow any responses to this entry through the RSS 2.0 feed. You can leave a response, or trackback from your own site. So excited! I’ve bought Everweb standalone about a year ago, when I got fed up with WordPress. When I heard you guys are planning a ‘blogging’ feature, I decided to wait until 2.0 is released, before I recreate my website. hi, I created the site using iWeb but since that is long gone as is my old iMac I am looking forward to perhaps trying Everweb. Is it compatible with mac os sierra 10.12? If I have to wait for Everweb 2, do you know when that will be up and running? Yes EverWeb is 100% compatible with macOS Sierra right now. EverWeb 2.0 will of course be compatible as well! We’re very excited for EverWeb 2.0 with blogging to come out as well! Yes, EverWeb 2.0 will be macOS Sierra compatible. At the moment EverWeb 2.0 is in beta test and we are working hard to get the new product out to the public as soon as possible! Thanks Erik! We hope to have 2.0 out to the public in the very near future! I use a lot hyperlinks in iweb as references in my blogs. Will they transfer over to everweb intact? Thanks for the question! EverWeb will preserve the blog heading, main text and fonts. At the moment there does not look as if links in blog entries are transferred over. I will ask the development team if this feature could be considered for inclusion in the product. If you have Navigation Links in iWeb to previous, next and index pages, you can recreate these very quickly and easily. There’s an update to this I will update this comment. Thank you everyone for the heads up. I will be going for it next week. The edition of a blog will be great. looks like I have some work to do.!! will Everweb be suitable for making multiple sites for other people too? Mind you, that’s just an idea at the moment. I have looked but maybe in the wrong place, can you put a PayPal payment into an ever web site? i know you made an option to do so on an iWeb site ages ago. Thank you to anyone replying. Please ignore my previous comment as I can see that you can purchase ever web with a hosting option. thank you. Thanks for your comments. Yes you can add PayPal in to your website as you did with iWeb. With the page you want to use selected, just go to the Widgets tab on the right of the screen. If it’s not highlighted click on ‘Widgets’ and you will see all the widgets listed. The PayPal widget is there so drag and drop it on to the canvas. When you have dropped the widget on to the Editor Window, you will see that you have all of the options available for the widget listed in the Inspector Window. Unfortunately it looks as if these will not come over at present and you will need to recreate them. I will see if this can be improved upon in future releases. I just tested the importing of links and actually links to external web pages will be preserved, it’s only if you link internal pages that the link is not preserved. Apologies for the mis-information!